News has been received in Nelson of the death in action of Lance Serjeant Joe Carter, 2nd Welsh, formerly in 11th Welsh (Cardiff Pals). Sjt Carter had only been at the front for a fortnight. Prior to enlisting he was a manager with Knight and Parker. This is the 5th death among local soldiers in action. Whilst in Nelson he resided with Mrs Thomas, 9 Station Terrace. 1911 Census report shows that the family living at 9 Station Terrace, Nelson at the time were called Hughes. There was a family of Thomas living at number 10, next door, but Evan and Rose Thomas already had eight of their own children listed at that address and at the ages of 10, 14, 16, 18, 21, 24, 26 and 33 years, it would have been rather cramped to accommodate a further adult. The 1918 register of electors shows a Bertram and Jane Watkins residing at 9 Station Terrace. 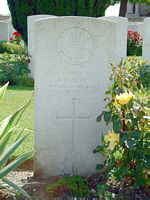 Bertram Watkins himself was a Driver in the Royal Field Artillery.